The Bora-Hansgrohe rider clinched a narrow stage-six victory at Paris-Nice on Friday. IRELAND’S SAM BENNETT of the Bora-Hansgrohe team said he was ready to fight for the Milan-San Remo classic title, after digging deep to clinch a narrow stage-six victory at Paris-Nice on Friday, his second win on the eight-day cycling race. Team Sky’s Michal Kwiatkowski kept hold of the yellow jersey ahead of Saturday’s potentially decisive mountain stage at the Col du Turini in the hills near Nice. Bennett looked to have left it too late in a reduced group who finished ahead of the peloton as French sprinter Arnaud Demare made the early run for the line. But Bennett unleashed an impressive last-100m dash to pip him at the line with Italy’s Matteo Trentin a close third. 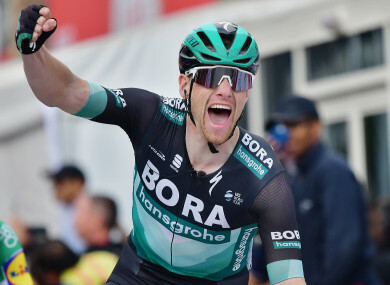 The 28-year-old Belgium-born Irishman also won Tuesday’s racing after making a name for himself last season with three stage wins on the Giro D’Italia. Both Bennett and Demare said the stage was promising preparation for the 291km ‘Primavera’ which starts on Saturday March 23. “This race was my first goal, then Milan-San Remo, then I will back up a little and try to refresh the head,” said Bennett. “Sagan will be there at Milan but I’m not going to tell you what our tactics are,” he said of his relationship with team leader Peter Sagan, an all-rounder and multiple world champion. The beaten Frenchman Demare, who won Milan-San Remo in 2016, said he felt he was weakened by the headwind. “I’m really disappointed, I saw myself raising my arms in victory, but to win you need that certain something and at Paris-Nice I haven’t had it. But physically I’m peaking and this is good for Milan,” he said. Saturday’s penultimate day of racing embarks from the coastal city of Nice and ends atop the Col de Turini after a near 15km climb at 7.3-percent gradient in the foothills that climb into the Alps. Team Sky are in pole position to win the tour with Kwiatkowski leading and their Colombian prodigy Egan Bernal just 18 seconds adrift, with other potential winners in Nairo Quintana and Romain Bardet needing to take at least a minute off them on the final climb. “I know the Turini well, I go there most summers and I was there just recently on recon,” said the Polish ace after Friday’s stage. 1. Sam Bennett (IRL/Bora) 176.5km en 4hrs 12min 35sec (average: 41.927km/h), 2. Arnaud Démare (FRA/FDJ) same time, 3. Matteo Trentin (ITA/MIT) s.t., 4. John Degenkolb (GER/TRE) s.t., 5. Bryan Coquard (FRA/VCC) s.t., 6. Anthony Turgis (FRA/DEN) s.t., 7. Florian Sénéchal (FRA/DEC) s.t., 8. Oliver Naesen (BEL/ALM) s.t., 9. Alexander Kristoff (NOR/UAE) s.t., 10. Egan Bernal (COL/SKY) s.t. 1. Michal Kwiatkowski (POL/SKY) 21hrs 35min 36sec, 2. Egan Bernal (COL/SKY) at 18sec, 3. Luis Leon Sanchez (ESP/AST) 22, 4. Wilco Kelderman (NED/SUN) 1:00, 5. Bob Jungels (LUX/DEC) 1:00, 6. Nairo Quintana (COL/MOV) 1:04, 7. Felix Grossschartner (AUT/BOR) 1:08, 8. Jack Haig (AUS/MIT) 1:17, 9. Rudy Molard (FRA/FDJ) 1:21, 10. Romain Bardet (FRA/ALM) 1:24. 53. Marc Soler (ESP/MOV) 22:15, 73. Simon Yates (GBR/MIT) 26:17. Email “Ireland's Bennett eyes Milan-San Remo after Paris-Nice double”. Feedback on “Ireland's Bennett eyes Milan-San Remo after Paris-Nice double”.